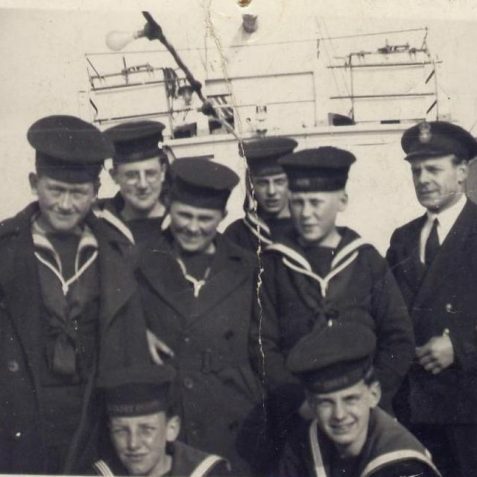 I was in the Hove Sea Cadets from 1951 to 1955. I have lived in Australia since 1960. I now live on the Sunshine Coast in Queensland. A couple of years ago, I bumped into an old Cadet shipmate who I hadn’t seen for 50 years. 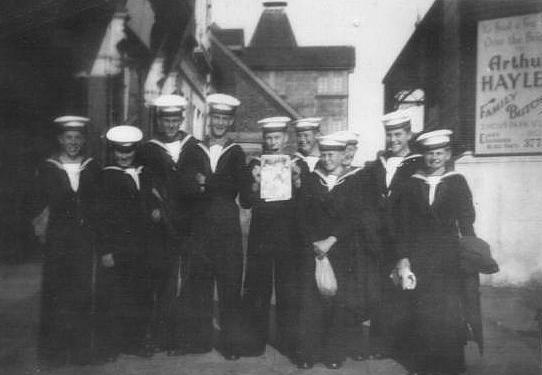 His name is Mike Watkins, he is in one of the photos, a group of ten out side Hove Station, he is standing behind, to the right of the cadet holding up a magazine. 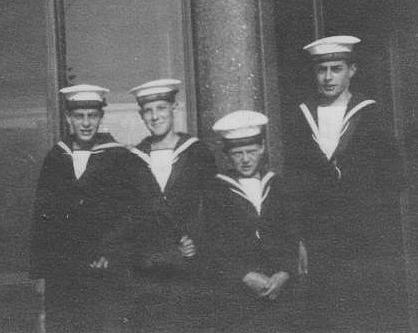 I hope that there may be some old Cadet shipmates still in Brighton and Hove that recognise themselves or someone else here. Would love to hear from you! Does anyone remember the unit in the 1940s? I believe my grandfather, Ernest James Coates, was connected in some way. I am posting this comment by request of Doug Lawrence. Please also see the others pages featuring Hove Sea Cadets. I joined Hove S.C.C. with my best mate Keith ‘Ted’ Reynolds around 1951; we were at Hove County Grammar School. Mike Watkins, I believe, joined about the same time, give or take a few weeks and Andy Hiscock joined shortly after. 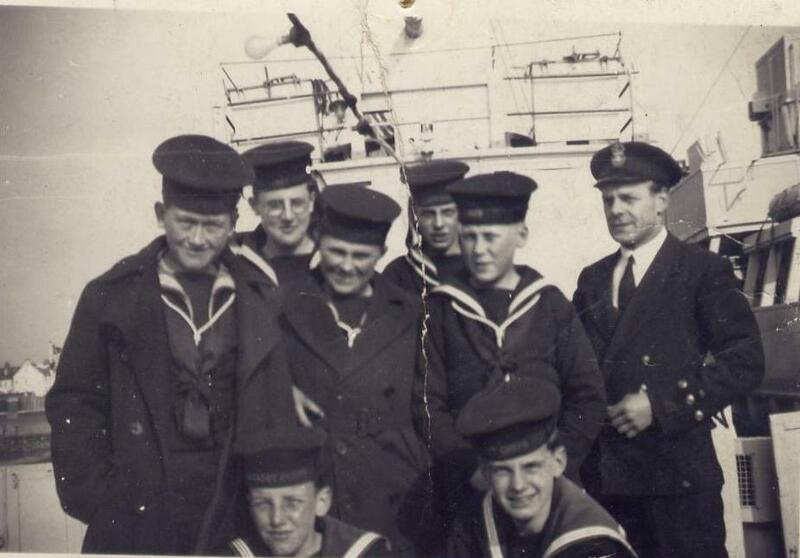 We were all in 2nd Port Division with L/S Mitchell in charge. I can’t for the life of me remember his Christian name – was it Colin? Whilst I was there he became a Cadet P.O. & a C.P.O. after Ted & I left to join the Royal Navy. I’m now living in Spain and I’m in the Torrevieja branch of the R.N.A. so if there are any ex-Cadets living here or holidaying here look us up. We hope to be doing a small self catering or B&B business soon, right out in the country, in the foothills of the mountains. We’ll try to get over for the reunion in November, but can’t promise anything. 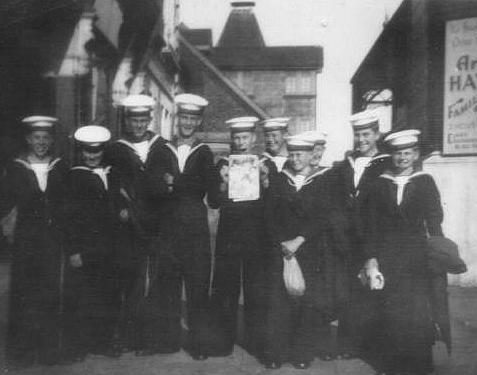 It was great to see the picture of the sea cadets from the 1950s! My brother Rodney is front row on right of picture; I was in the cadets at the same time but am not in the picture unfortunately. i do remember the faces of those in the picture well it was great seeing them again, I remember Keith Upward and his brother Hugh, I used to play with them as a boy and went to church with them also; I wonder where they are now? Thanks for the trip down memory lane, and fantastic website, keep up the good work. I was quite suprised to see this old photo of myself during my Sea Cadet days. We had just returned from a trip around the Isle of Wight on this old Minesweeper. I am on the extreme left. My football friend, Mike Powell, is directly below me. I left England in 1967 for California but we met again for the Hangleton Football 50 year reunion in 2007. Hi Keith, can you tell me if my dad is in this photo? It looks like him and I know he was in the cadets about that time. His name is Barry Cowie.